Blackjack game is the one that can be found in any gambling corner of our planet. It is pretty cool to play, easy to learn and very exciting to win. It seems that every player has tried this game at least once. Moreover, the game is extremely popular and that is why there are tons of the variations to choose from. And the variations create field for strategies development. Blackjack strategies are really existent and true. It is not roulette game, it is the game, which is based on mathematics and logic. One of the strategies, which the casinos hate is card counting as using maths, calculations and logic they are aimed to lower house edge as low as possible. Your main goal while applying card counting strategies is not to get busted by the casino staff. The second goal is to win as much cash as possible or get much cash and leave before they catch you. 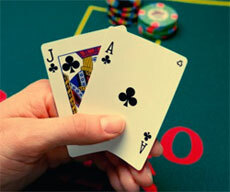 There is one more aspect you should know about this strategy of how to count cards in blackjack. You should not apply it to the online blackjack games. It is useless, as in the Internet games after each round all the cards are shuffled. So, you cannot track the cards down. Your starting point is always 0. And with the flow of time and the cards dealt you add or subtract. There are balanced and unbalanced systems. The former starts with 0 and ends with it. If you do not finish with 0, it means that you made a mistake at some point. The latter, which also starts with 0, does not necessarily ends with 0. It is a balanced system. It is extremely popular among the card counting teams. There are many books written on how to count cards according to Hi/Lo system. It is very easy to learn and then apply. But just like any other blackjack strategy, it requires your whole attention. At the same time you are to play and make the bets. The cards count is simple in the Hi/Lo system (card counting systems). 20 small cards are counted +1, the next 12 medium cards are 0, and the high 20 cards are -1. As you see we have 20 + 12 + 20 = 52. And 52 is the number of the cards in the deck. And at the end our count is to be 0. The name of KO system (system for counting cards) corresponds with the aim of it. If you succeed in applying it, you will definitely "knock out" the casino with your winnings. The "eye in the sky" will not notice anything, as you were not cheating but be careful anyway. Once your count is +2, you should raise your bets. If the count goes up, you should do the same with the bets but once it starts lowering, you should decrease the bets as well. It is an unbalanced system. It is supposed to be easier than Hi/Lo system, as the conversion between the running and true count is not difficult. Once you have issues with applying Hi/Lo system, you should give the KO system a shot, especially if you are a vacation player. You should not expect that you will bring the house down, once you learn how to apply this strategy, as there are many blackjack variations. But be sure, it is worthy of learning.